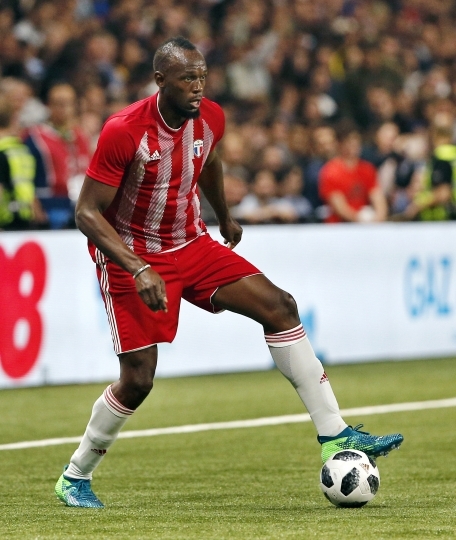 SYDNEY — Usain Bolt is making a run at professional soccer in Australia. The Olympic sprint great has long expressed his love of the game. Since his retirement from track, he has tested himself with Germany's Borussia Dortmund and the Norwegian club Stromsgodset. Now, at 31, he will try out for six weeks with the Central Coast Mariners starting next month. If all goes well, he could play for a season in Australia's A-League. Australian agent Tony Rallis said Monday the Mariners and Bolt have a deal in principle, "subject to a couple of benchmarks." Rallis said the eight-time Olympic gold medalist would have to go through a tryout, and the Football Federation Australia would have to support his salary. "Once the FFA comes back and says that they'll be part of the process, we're going to the trial," Rallis said. The agent said the Mariners would guarantee 70 percent of his salary and the FFA would be expected to pay the rest. "If he's competitive, he will lift our A-League profile," Rallis said. "He will create dreams for young people and he will give the A-League a profile no amount of money can buy. This bloke's an ambitious athlete. The A-League needed a hero and we got superman." Mariners chief executive Shaun Mielekamp said there is still a lot of work to do, and the tryout is essential in determining the skill of the 6-foot-5 Jamaican. "It would only be big if he can play and if he can go really, really well," he said. "Because if he comes and he's not up to the level then it actually has a detrimental effect. "But if he comes and he's as good as our reports are saying that he can be, then that would be very exciting and I'm sure that this stadium would be pretty full every time he put the boots on."